The cat continues to play with her mice…and one of the mice begins to realize that he’s in a cage. Soon-Im asks Do-Jin for his opinion on the tea and he answers that it was a bit flavorless. Soon-Im nods at that as Seung-Hye quickly takes a sip herself to Soon-Im’s clarification; Seung-Hye did not let the tea brew for long enough due to her nerves…she should have brewed it for 3-5 minutes. Soon-Im then offers a cup of her own brewed tea to do in to try and he comments on how much deeper the taste is. Dae-Shil returns to the chicken shop to see Kyung-Tae and declares that the “Weird Man” is here. Kyung-Tae yells at her for calling him weird when Joon-Bae arrives to to tell him to understand Dae-Shil as she’s going through some difficult times. Kyung-Tae tries to defend himself by explaining that he even did his best by waiting with her during the night when she was drunk in the bench. Hearing that Kyung-Tae spent the night up with Dae-Shil, Joon-Bae immediately orders that Kyung-Tae takes Dae-Shil home and introduce himself to the family. He tells Kyung-Tae that Kyung-Tae has no excuse as Dae-Shil lives at the house called Dong-Rak-Dang. When Dae-Shil gets up to leave, he sends Kyung-Tae along. At the same time, Seung-Hye sees Do-Jin out and thanks him for paying special attention to her grandmother. Do-Jin responds that it was nothing and he was able to taste such valuable tea. However, before he leaves, he asks Seung-Hye for the advice that she had began to say before being stopped by Seung-Ah. Seung-Hye notes that it is not something that she can say just standing there and Do-Jin invites her to his cafe. There, Do-Jin explains that he only has a month to increase is revenue or give up the cafe, which was his mother’s condition for letting him continue the cafe enterprise. In response, Seung-Hye suggests that Do-Jin focus on Korean traditional desserts as Buk-Chon (the neighborhood the cafe is in) is a site for tourism. Meanwhile, Kyung-Tae accompanies Dae-Shil home as she drunkenly sings. Getting annoyed, he pulls her up to give her back her purse. When he looks at her, he sees that she has tears in her eyes and pauses as the wind blows her hair in his eyes…Looks like the love bug has hit! He accompanies her all the way to the door singing as well. Before he leaves, Seung-Jae arrives and Kyung-Tae just tells him to ask Dae-Shil for his relevance. Dae-Shil responds that Kyung-Tae is a weird man hahaha. She stumbles home to drunkenly yell for her mother, “Dong Rak Dang’s Tiger!” Dong-Sook arrives to tell Dae-Shil to sober up and Dae-Shil answers that she wants to sleep with her mother that night. Soon-Im cannot help but wince as Dae-Shil sobs next to her even as she pretends to be asleep. The next morning, Dae-Ho sighs before going to work and Dong-Sook wakes up densely unaware that Mi-Ja’s revenge is slowly blooming. She decides to send lunch through Seung-Hye. Seung-Hye arrives to find fraudster #1 accusing Dae-Ho of being a fraud that stole the painting from his father…He throws Seung-Hye to the ground, which gets a response from Dae-Ho. Soon, Seung-Hye is trying to pull Dae-Ho away and the grandfather arrives to grab Seung-Hye’s hair. Dae-Ho tries to get the grandfather off of Seung-Hye and he ends up falling to the ground. Not realizing that this is a show, Dae-Ho and Seung-Hye rush over to help the old man and the younger fraudster throws Dae-Ho away. He ends up falling on broken glass and getting wounded. Dae-Ho and Seung-Hye offer to call 9-1-1 but the fraudster insists on carrying his father to the hospital just as Sang-Man “innocently” arrives at the scene. Seung-Hye glumly arrives at work and does not hear Yunho cheerfully call out to her…In the employee’s room, Seung-Hye debates on whether or not she should call Seung-Jae. Back at Dong Rak Dang, Seung-Jae tells Dae-Shil that he will help her speak with the other writer who is accusing her of plagiarism. He tells Dae-Shil to aggregate all of the evidence of when she first wrote the novel. Miss Bom arrives at the cafe to tell Joon-Bae about the ruckus that happened in front of Dae-Ho’s store. When Sang-Man walks off, Joon-Bae arrives to help. Much more practical, Joon-Bae jumps in to yell at the fraudster for accusing Dae-Ho of fraud. 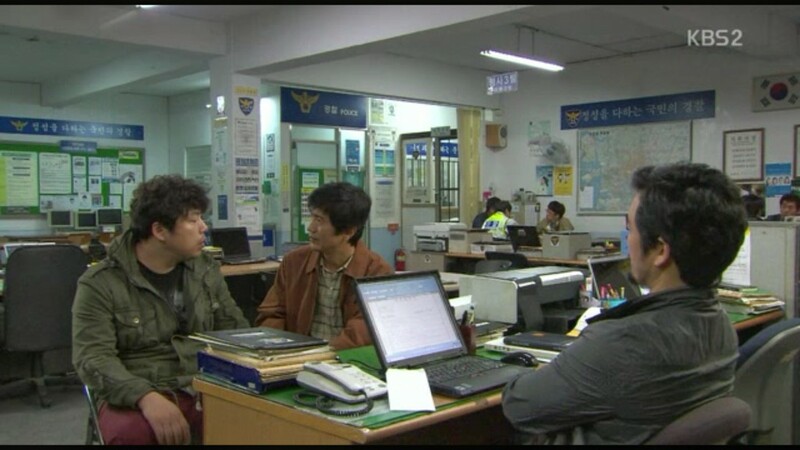 He comments that the fraudster looks more like a gangster than his brother-in-law, but Dae-Ho agrees to go to the police with the fraudster first. When Joon-Bae looks up, he sees Sang-Man and sees to recognize him. Sang-Man also recognizes Joon-Bae and quickly runs off. At Yunho’s cafe, Yunho sees Seung-Hye accidentally pour hot water on herself. He asks if she forgot to the do homework and tests her with a coffee bean, which she gets right. At the police station, the fraudster brings a dementia diagnosis. He also tells the police officer that he’s going to press for criminal charges. Sang-Man reports back to Mi-Ja, but he also seems a bit off guard. Looks like the writers have some mercy after all! They are building in a safe-button? Anyways, Dong-Sook’s early arrival at Mi-Ja’s apartment provides some comedic relief as Sang-Man as to hide in the bedroom since Dong-Sook knows Sang-Man as the building owner’s representative. If they want to keep Mi-Ja’s identity a secret, Dong-Sook cannot see him there! Luckily for them, Dong-Sook forgot some ingredients and runs out to the market…Mi-Ja confesses that she only called Dong-Sook to her apartment to play a joke but this is becoming more difficult than she expected and Sang-Man runs out. 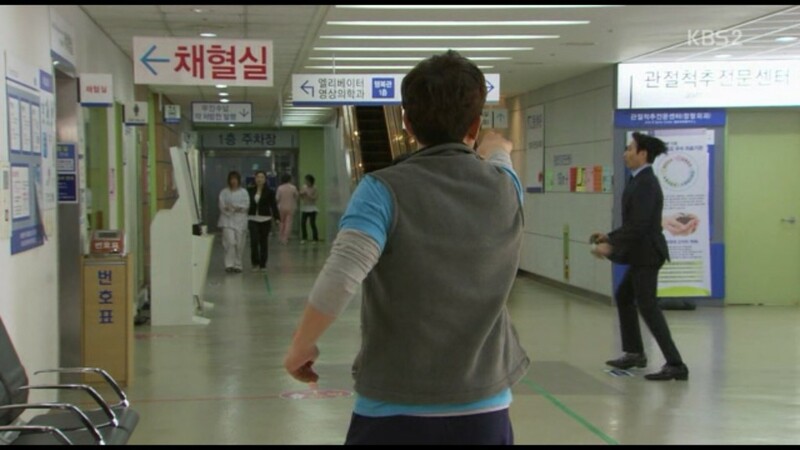 At the same time, Seung-Jae rushes to the police station. The question then remains, does Mi-Ja want acceptance from the family? Or will Soon-Im’s ruin be enough for her. How much of ruin will be enough. Additionally, Seung-Hye’s birth secret has the ability to throw a wrench in the loop if she is Mi-Ja’s daughter. However, if she is Beom-Seok’s daughter, the mother-daughter tension will not be there…rather, it will be the sister-sister tension. Finally, where the heck does Sang-Man and Joon-Bae’s connection come in?